Let’s get this straight, I am NOT on a diet. I don’t believe diets work in the long-run. And most experts who aren’t trying to sell you a diet plan will agree. But. And here’s the kicker. Despite the fact that I exercise most days, and even though Hubby and I have made numerous healthy changes in our diet since his heart surgery… I’ve gained five pounds in the last three years. Now, how the heck did that happen? I was shocked when I stepped on the scale a couple of weeks ago, even though it only confirmed what I’d suspected. I had gained weight. My jeans and my mid-section had been telling me the whole sad story for a while. Now don’t go all preachy on me, people. Or try to talk me out of the idea that I need to drop a couple of pounds. I know what I look like when I step out of the bath, and you don’t. Thank goodness. Ha. I also know what I look like in my jeans before I don that artfully draped scarf, or the loose tee that falls to just the right place to hide what needs to be hidden and not hide what I’m still happy to show the world. And here’s the other thing. Those artfully draped scarves and tees weren’t always doing the job anymore. This, in part, contributed to the confidence-sapping moment that day a few weeks ago when I caught sight of my profile in a store window. Once my suspicions about my burgeoning middle were confirmed, I thought I knew the reason why. Despite daily exercise, I move a whole lot less than when I was working. Teaching burns calories. Talking to a room full of teenagers, animatedly waving my hands around, moving up and down the room, up and down the halls, and up and down the stairs at school all day helped me stave off what I call “slippage.” That slippery slope of weight gain that creeps up on most of us in middle age. I wrote several posts about slippage a while ago, starting with this one. So what can one do? I guess I could go back to work. That would be simple, right? Ha. But not feasible, even if I were so inclined. Should I stop doing whatever I’m doing that keeps me sitting in my chair more than I should? Like reading, or writing this blog. That’s not going to happen. I’m not going to give up what I love in order to shed a few pounds. So… should I go on a diet? The answer to that question is a resounding NO, according to my sources. Especially if that diet includes making drastic changes to my eating habits, changes that will be insupportable in the long run. Like the “boiled egg diet” which seems to be making the rounds of Facebook these days, claiming to help you lose 20 lbs in 14 days. Just for fun, I checked it out and it prescribes as many as four eggs a day! Four eggs a day! With nary a warning to people who might have cholesterol issues. If Hubby’s cardiologist read that, he’d have… well… a coronary. I’m also not going to go on the South Beach, or the Sonoma, or the Beverly Hills diet. I won’t be climbing onto the Wheat Belly bandwagon, which the dietitian at the Ottawa Heart Institute completely debunked at a workshop we attended a couple of years ago. Nor am I going caveman with the paleo diet, or the ketogenic one. I’m sure all of these plans would make me drop those five pounds in a few weeks. But what then? The idea of rebound weight gain is nothing new. We’ve all heard about it. But now scientists are finding the data to support what we’ve really always known, but rarely admit. Neuroscientist Sandra Aamodt, in her Ted Talk “Why dieting doesn’t usually work,” says that people who lose 10% or more of their body weight find that their “resting energy expenditure” drops, and they will need on average 200-400 fewer calories a day to simply maintain their set point, the weight at which our body seems most comfortable with itself. She adds that successful dieting does not lower one’s set point because, unfortunately, our bodies work hard no matter what we do to keep our weight stable. She does add that our set point is not a specific weight, but a range of usually 10-15 pounds. And that it’s conceivable that we can “use lifestyle choices to move our weight up and down within that range.” But outside of the range… it’s a losing battle against biology, hormones, and our brains. So what am I doing about those five pesky pounds? Well, while I’ve not been on a diet for the past couple of weeks, I have been on a fact finding mission. I’m using a free on-line food tracker to record what I’ve been eating and how much exercise I’ve been doing. I always track my exercise, partly because I love numbers, and partly because I work best if I have specific, measurable goals for myself. For the past year I’ve been trying for 300 minutes of cardio a week. This on-line program helps me to see how many calories all that cardio actually burns. And how many calories I’m consuming daily. I know it’s not just about the calories, but seeing the numbers always helps me… because for all my airy-fairy tendencies, deep down I’m a numbers person. I want to see the numbers generated by my food choices. Turns out I didn’t know the whole reason for my weight gain. What I’ve learned from my food journal is that I have fallen off the healthy eating train that Hubby and I boarded together five years ago. Too many treats, too many MacDonald’s french fries, too many lattes, too much bread, not enough fruit and veg with breakfast and lunch, and too little portion control. So, I’m not going on a diet, I’m just going to make healthier choices more often. Putting back into play all those wise decisions that Hubby and I made about our eating habits five years ago, and which I’ve let slide a bit lately. I won’t be making major changes, just tinkering. Just being a bit more mindful. I figure that I’m following Ms. Aamod’s advice and “using lifestyle choices” to play within my set point range. As far as exercise goes, I’m already walking and cycling or pedaling my exercise bike as much as I can. But I’m trying to fit in more weight work-outs. I’ve let those slide a bit. Mostly because this time of year I prefer to get outside for my exercise, and a weight workout is definitely an indoor activity. Maybe I should move my weights to the deck? Now, that’s a thought. I know there are other solutions that I could consider. But whatever I choose to do has to be something that I will be able to maintain, that I will want to maintain, and not something that I will dread. Like yoga classes or swimming. Both fine forms of exercise, but not for me. This afternoon I was discussing this post, and my research findings, with Hubby. And we were talking about health and diet and the importance of having a realistic self-image. I do realize that it would NOT be healthy to expect to ever again weigh 125 lbs. Or even 135. But it’s not unrealistic to want to be a bit better than I am at the moment, whether that’s three or four pounds lighter, or a bit more fit, and stronger. I think Hubby still holds a faint hope that I’ll carry the canoe one day. Ha. As Hubby and I continued our conversation, I related to him what I’d read about all those famous diets, the boiled egg diet and the Beverly Hills diet which are so unhealthy, the South Beach and the Atkins diets which were so popular in their day, and the current keto craze. And it occurred to me that the problem with all those diets, even the ones that prescribe healthy foods, is not that they don’t help people to lose weight, but that they do. Because according to the experts I listened to and read today… that’s when the really big problems start. And that, folks, is primarily why I am not on a diet. Have a listen to Sandra Aamodt’s Ted Talk for yourself. It’s pretty interesting. Now, I must run. Hubby is watching the World Cup, and I’m making dinner tonight. Yes, I am. Don’t fall off your chairs in amazement. I haven’t entirely forgotten how to cook. So, how about you my friends? Any diet or fitness challenges that you’ve faced lately? Any that you want to tell us about, that is? 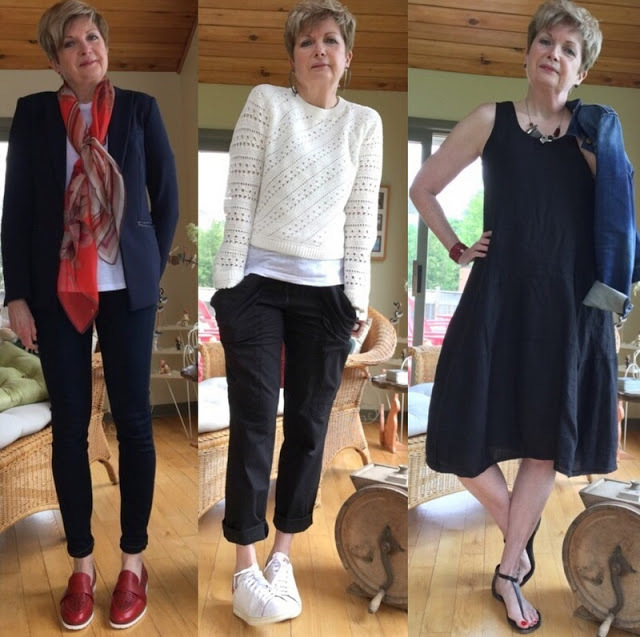 Reflections on 2018… Wardrobe Wise. Thanks for writing this, and the TED Talk with Sandra Aamodt. I needed to read and watch this right now. It’s frustrating how the weight just sneaks up a pound or 2 at a time. You're welcome, Cerena. It is frustrating how weight can creep up verrry slowly… I'm now 10 lbs heavier than I was in my thirties. But I'm not going to try to get back to that earlier weight. I’ve been doing the same thing since i got home, dialling it back to the healthy patterns I know I’ve slid away from. It’s tempting, sometimes, to try a more concerted approach and lose the ten pounds that take me down a size, but I know they don’t stay off so I’m sticking with healthy choices, smaller portions, and regular exercise in activities I enjoy. I agree Frances. I sometimes look in the mirror and think… know, actually… that if I really tried I could get back to 135. But according to everything I've read, then the real battle would begin. And it's just not worth the risk. I have a relationship with a number too – but I'm shorter than you so it's lower. I have the number from my early and mid-50s, 122, and the number from a couple of days ago, 127, and the number that I take as my North Star, i.e. 125. So if I hit 127 I am OK but, I eat a lot of salad and jarred tuna for the next couple of days. If it's 125 in the morning, I'm game for a fried roll with my pho;). I said goodbye to 122 because it was just too hard to keep up, and, as I say below, I kept getting sick:(. I told my jeans they either had to expand or they were out of here. Darn. I was going to write a similar post…good for you. Up to you entirely. You are probably unlikely to do anything stupid or dangerous and have recognised that slippage happens. You don't have to like slippage or accept it and cutting back on food (we all eat far too much, let us be honest) is how it is done. Walk the streets and look about you if you doubt that. Diets are one of the great flash points, I find. People can become completely irate if you even announce you are tired of not being able to fit into your trousers. As ever: cool your jets. That's your choice, not mine, I'd prefer to get back into my trousers, thanks. As you have carefully pointed out, a bit of research about eating pays off with interest. I wish you well and here is my bet – you won't find it hard to do. Thanks, Annie. What is hard for me to do is to NOT try to get back to 135 lb. As I said to Frances, from everything I've read, losing the weight is the easy part. So many of those weight loss programs focus on a quick loss for the first couple of weeks… that's short term "gain" (or loss as the case may be) which will lead to long term pain. And once the weight is gained back and more, that new higher number usually becomes your new set point, according to Sandra Aamodt. Yes, I'm with you. After a month of vacationing with my visiting daughter and a big double birthday party, complete with everyone's favorite not-so-healthy foods, I'm back on the wagon. My Fitness Pal is my tracking app and it's a blessing and curse. Some days it shocks me. But reality must be faced. I also find it much harder to drop those creeping pounds as I've aged. Ugh. But I feel much, much worse when I eat all the indulgent (read: salty, sugary, fatty) snacks. So I guess my body is telling me something and I'd better listen. Oh, me too. I feel icky when I eat fast foods, all the stuff I used to love. Potato chips still call to me from the grocery shelf from time to time… but I try to resist. We only indulge in that kind of stuff now when we're camping. P.S. That TED talk is wonderful…thanks for sharing it. I agree that slippage can and will certainly happen as we age but its not something you don't have some control over. I know there are some health issues that make this harder for some folks, but for the rest of us, its just about making healthy eating choices. I highly recommend http://www.nutritionfacts.org as a resource for optimal healthy eating. I am a nurse and it is the scientific studies that support the whole plant food way of eating that I appreciate. It is most definitely a lifestyle change. My cholesterol has dropped and I feel great. Oh yeah, and I lost 15 pounds. It has been 2 years and I have no desire to return to my old unhealthy ways of eating. I looked into a plant based diet when my husband was diagnosed with heart disease five years ago. In fact I drove myself crazy researching. The dietitian at the heart institute finally helped pull me out of my attempts to micro-manage our diet. Now we eat lots of vegetables, less meat, mostly lean chicken and pork, and lots of fish. Our issue was that we already ate a pretty healthy diet, just not healthy enough for someone who has a predisposition for heart disease. I agree that healthy eating is the key. But I now believe that it's not as easy to effect weight loss on a permanent basis as I used to think. At least not for everyone. I love this. A few years ago everyone in my office went on a crazy diet of less than 1000 calories per day. They were moody and fussy the entire time, and the minute they stopped the weight came back and even more. A good lesson for me. At 5/2" I can't afford major weight gains, but I did put on an extra 10 – 15 a few years ago. A careful diet (but not draconian) and trying to replace the exercise lost when I stopped teaching has helped to keep that off, although I still have to be mindful that the once a week french fries don't turn into more! Who knew that teaching was such good exercise, eh? I have to watch the french fries. They are my weakness, along with potato chips, and homemade biscuits. I have to ration those treats more carefully! You're welcome. I did a ton of reading in the past couple of days, on top of what I normally read and set aside as possible blog topic material.And I noticed that sooo many advice articles came from those who had a program, book, or diet plan to sell. So much of the info in these sources was incomplete. For instance, of course obesity is linked to disease (as many sites say)… but further studies have shown that obese people who exercise, eat a healthy diet, don't smoke, and drink moderately are not any more unhealthy than thin people who have good lifestyle habits. That stat really interested me. I've found that cutting back and being very mindful of my eating habits for over six months has resulted in a weight loss of 6 lbs. That is NOT what I was hoping for. On top of that when I started getting really fed up with my slow progress I managed to gain back 2 of those pounds in 2 weeks despite extra exercise. I'm a very healthy eater, low sugar, no meat, no poultry or fish, no dairy, no alcohol, no bread, I'm borderline vegan for Pete's sake! And still my body refuses to budge. I often think about another blogger who said all she did was give up eating a pack of chips every evening and she dropped 20 lbs and I wonder what the heck is wrong with me. It is very frustrating not being able to fit comfortably in almost all of the pants in my wardrobe. I used to enjoy baking and I gave that up entirely. I'm not a happy camper and I don't like accepting this as my new normal. Perhaps she was eating a family pack of chips every day…that would make a difference. Don't despair. I admit that I have simply embraced the additional 5 pounds. I work really hard to keep it to 5. In my case I did it because I found I was getting sick a lot, as though my body just needed more flesh. So I said OK. I'm not one for McDonald's, etc., and my cholesterol has risen so I have to stay away from cheese and red meat, but when I'm hungry I am weak and crabby. I eat a lot of nuts and olive oil and whole grain bread and apples. So here we are. That said, I am still trying to work enough exercise into my days. Sigh. You're right, Lisa. Here we are. I'm also thinking that I need to help Hubby in the garden. Maybe I need more movement that is not just dedicated exercise… like cardio or strength training. Just movement. Sue…You kept the cream sweater! I love how you've styled it. Looks great! I've been thinking of my own added 5 or so pounds which crept on the past 2 years. I love food and have miminal discipline. I enjoy reading the comments and what others do. I do understand calories in & out. My Fitness Pal does help. I will look up what Martha suggested. South Beach, the Zone, Suzanne Somer sit with my cookbooks. I've become lazy! Good nutrition is work. I ceased my workouts due to past work and sports related injuries. After a year of osteo, massage and acupuncture….I'm back! I recently joined Orange Theory Fitness (60 mins) and go twice a week. So there is 120 mins and a far cry from your 300 minutes. As I write this, I look upon my pool and think I could easily add many more minutes. Ha! The video was interesting. Thanks for the share. I do the half tuck with my tops…it breaks up the waist line…or so I think! Thanks, Robin.By the time I'd found some outfits I liked with that cream sweater it was too warm to wear it. Maybe when we're down east in August where it can get cool at that time of year. Injury can play havoc with a fitness regime can't it? We've hardly cycled this summer because I was having physio for neck problems, and I couldn't bike comfortably. Then it got really hot. Hopefully this weekend I'll be back in the saddle. I think it's natural to slide and then get back into fitness again, then slide again. Ha. I've been doing it for thirty years! Getting back to normal will probably work, don't you think? Just don't go on any crazy diets… you look great! Hubby and I were surprised when he was recovering from his heart surgery how great walking is. He kind of scoffed since he's used to much more strenuous exercise, but now we both love it. I do it more than he does, since I can't run anymore, and haven't been biking in a while due to neck issues. Good luck with the ongoing regime. I agree that it's wonderful to go back down a size. Also struggling with some extra pounds. I find a fitbit has helped me to focus on how many steps I take in a day. I love when I break my own record! lol I'll definitely will be visiting again. P.S. I love achieving or surpassing those numerical goals too! Ha. MacDonald's fries are my biggest weakness. Except for the hand-cut fries we get around here only at "chip wagons"… french fry trucks. Oh my… they are delish. It's good for me to know just how many calories are in that "little" treat. Helps me to say no thanks. Read this earlier today, thought I must comment later, then came back to find this wonderful thread. Obviously you hit a nerve. I have kept the same weight as from age 21(64 now) but it is the darned slippage that is getting me. I exercise and am a healthy eater, and have had to adjust even more the last couple of years due to some health issues. Despite daily walking of 4-5 miles and 3-4 yoga classes a week, I am thickening through the middle. I look in the mirror and see my mom and her 4 sisters, who were all much taller than I, but gradually gained a belly as they aged. I am fighting it with trying to stay active, but I refuse to starve myself. I become the poster child for hangry, and even the dog is wary of me in that stage. Maybe I will download the Fitness app and try that. I am grateful to be my age and be able to do as much as I do, and am trying to accept that this ol' body is doing it's best to house me that it can. I would not judge anyone else with as hard an eye as I judge myself, yet knowing that, it is still a constant struggle to not self-criticize. I love your blog and the thoughtfulness of your readers as well. Thanks, Judy. Lots of great comments on this post. Thickening is what I've been experiencing as well. Comes from having long skinny legs, a short torso, and no where else for the weight to go. I try not to get too caught up in self-criticism. But when I look at pictures of my thirty year old self, it's hard not to be discouraged. Me too. I have always been slim and do not want to lose weight but in the last 18 months I have slippage too and I don't like it. It started when convalescing from a minor op that has also prevented me from doing certain exercises. Can you tell I am looking for excuses? I eat healthily but need to get back into some sort of exercise routine so that I can firm up the slippage! In addition to what I eat and how much I eat, at this age (60), I find it also matters when I eat. My evening meal is eaten relatively early (6:00) and it's a smaller meal than it used to be. I've also learned that even moderate alcohol consumption can contribute to the belly bulge so many woman of a certain age complain about – just saying. Oh.. I hear you. Trying to balance between being self-indulgent and being so strict so that I don't enjoy our evening meals… which is always our best time of day. I’ve been very cognizant of my carb intake, particularly because my husband borders on Type 2 diabetes (he’s what they refer to as a skinny diabetic.] After a couple of hard weeks, I have experienced fewer afternoon energy crashes and constant hunger of previous diets. Check out the Canadian doctor Jason Fung. Very interesting …. Carbs are my biggest weakness. Of the potato or bread variety. I will check out that source, thanks. Healthy diet (and there are many questions what it really is and it differs in different parts of the world) and healthy style of life could help. Mindful eating is crucial IMO: divide your meal in three parts,eat slowly,chew more times and ask yourself after every part "Do I need the rest?" If you have late evening cravings,first do something:wash the window,dust,make some abs exercises…..and if you want to eat it after that anyway…well,you'll have the clean window! Stop eating from politeness,not to leave food on your plate,not to offend someone….. Dividing your meal sounds like a great idea, Dottoressa. And stopping when full is the mindful eating that Sandra Aamodt speaks about. I have to say that Sandra Aamodt has a veeeery nice dress ,no? Just something I need right now! I am in exactly the same situation as you are right now… carrying about 5 extra pounds that seem to have located themselves mostly around my middle. I find summer the worst time for this, but I don't want to let it get out of hand. Every now and then, I use MyFitnessPal.com to track my activity and my food. That always seems to help, so thank you for reminding me that I should do it again! Summer has always been the worst for me, too. When I worked I gained in the summer and lost it again in the fall. I find that tracking things helps me. I don't do it every day, though. I try to follow the advice of the dietitian at the Heart Institute who said we should eat very healthy for 80% of the time. Another one here, the same 5lbs have landed around my middle since the beginning of this year. I’m 66 and been a stable weight for around 6 years. I can’t pinpoint any one reason so resigned myself to say it’s complicated. In a panic I called my doctor to insist it must have something to do with a couple medications but was told politely, no. I run, walk minimum 15m steps daily, yoga, limit alcohol. I try to use a measuring tape instead of a scale as there is too much anxiety with a daily weigh in. I agree with what another reader mentioned, weight does not appear overnight and requires taking an honest look at your habits. I keep telling myself it’s onky 5lbs but I still don’t feel good about it. Looking forward to watching the TED talk. I seem to have been a stable weight every decade… it's just that each decade it creeps up a few pounds. But 5 lbs in a couple is years is too much. My measuring tape is just as nasty to be as the scale! Ha. Like Lisa (Amid Privilege) I've just embraced my extra 5 lbs. I eat extremely healthy, I do have a glass or two of wine every night (and might lose the 5 lbs if I didn't) but my BMI is still considered good, and if we're all gaining this bit of weight in spite of our efforts – maybe it's meant to be? I still have to work hard to keep it at just the extra 5, but I'd really have to be deprived to lost those. Not interested. I'm with you, Kathy. I'm not interested in adopting a draconian regime to lose a few pounds and then be stuck with depriving myself for the duration. I still need to watch the wine though… some nights my "glasses" are definitely more fulsome than others. Ha. Oh gosh, I am forewarned ahead of 60! I actually lost around 10lbs when I took early retirement 2 years ago at age 57. Not sure exactly how, but I did stop eating between meals and have never gone back to snacking (no more biscuits during dull work meetings), and stepped up exercise. Perhaps the weight fell off because I was also very happy! The weight has stayed off so far. My taste is naturally for fruit and veg – but also for cheese! Don't like fast food – think the last burger and chips I had must have been around 20 years ago out of desperation at a motorway service station. But I do notice a little summer tummy podge – probably the result of too much sugar from our mountain of soft fruit in the garden, and a fatal weakness for Magnum chocolate coated ice creams. So your post is a very timely reminder to exercise a bit of portion reduction, increase the exercise, and lay off the Magnums! Oh… I have a weakness for chocolate covered ice cream as well. I've learned to satiate it with chocolate frozen yogurt which has less fat and fewer calories, but still has that fudgey taste. I may have to get some of that will power stuff I've heard about ! So interesting, Susan! I didn't know that about the 15 pound range and that makes me feel better since I do tend to go up and down within that range. But yeah, let's face it. Age makes a difference too, right? I never had a tummy until menopause. I'm trying to fight the good fight with some healthy choices and exercise. It amazes me how many otherwise intelligent women do these totally crazy diets. I have a friend who is one of the most well-read and thoughtful women I know, and she's currently fasting every other day. How could that be good?!! Anyway … always love your posts. I'm enjoying my summer away from teaching and having time to visit more blogs! Thanks, Emma. The red loafers are Earth Brand. if you scroll across the picture you should see a box appear with all the brands listed:).